Streamlined, not too bulky. Fabric color, and texture is blah. Think I will recover it. Just as pictured, otherwise. Embrace luxury in your casual space with the understated comfort of ottoman. Constructed of solid rubberwood frame in dark walnut stain, the ottoman is upholstered in light grey polyester fabric, providing exceptional strength while maintaining compact and smooth surface texture. 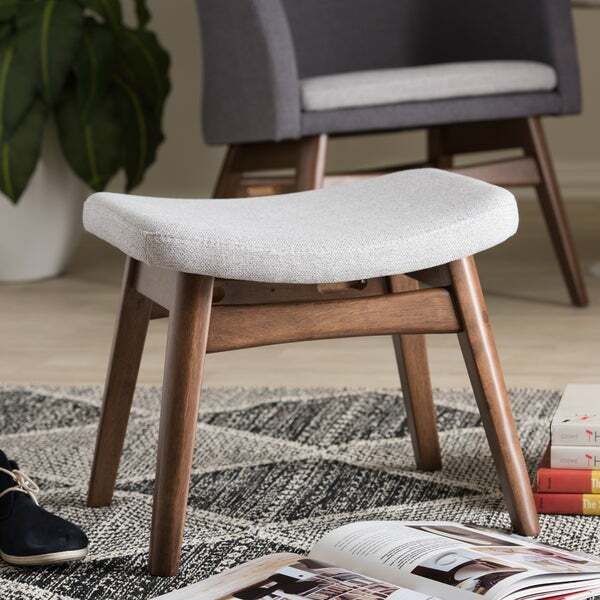 Padded with high-density furniture foam for structural support, the ottoman features sleek design with tapered legs and Scandinavian-inspired, mid-century styles-lines for contemporary looks. Made in Malaysia, the ottoman requires assembly. I just received two of these stools and they look great! I'm very happy with the quality of materials and the look. The foam used for the cushions are fairly firm, so these should last a long time and maintain their shape unlike cheaper, softer foam. The wood veneer finish looks like American walnut, which matches well with our existing walnut furniture. There is quite a bit of assembly required and you will need a Philips head screwdriver and a small hammer. It's advisable to also apply some good quality wood glue for the wooden pegs that come with the kit to make sure these areas do not become loose over time. Wood glue will expand as it dries and stay a bit elastic so it won't crack after it dries. If you are going to use these on a wood floor, you should also buy felt pads to put on the feet to avoid scratching your floors. These do not come with felt feet. The fabric is textured like a course linen, but soft to the touch and are a light, pale grey colour, which match very well with our charcoal grey sofa. These are by far the best-looking mid-century-style footstools I have found. I could not find anything like this anywhere in the Toronto area and you can't beat the price! The delivery came in a couple days ahead of the estimated date, which worked out very well for me. And they did try to call me a day earlier, to arrange for delivery (although I missed the call). In the end, I got the packages and I'm very happy with my purchase! Really impressed with this footstool. Perfectly sized for a smaller space. Just the right height and design to match my mid century chairs. Extremely easy to put together. Cute little ottoman that fits the mid century style and perfect for our midcentury leather chair. Love the look of this piece! Granted, it's pretty hard to assemble (took well over an hour because of poor design of where the screws go), but it looks great and am overall satisfied! Easy to assemble and the wood is beautiful! This is the perfect footstool for my mid century chair. Easy to put together. Just love it. I would call this color oatmeal not light grey. comfortable. stylish. and the color of the legs match the fabric color well. i will not order again just because it doesn't the rest of the room. These look and sit great. Got them for extra seating and they are perfect! I will likely r cover them - the grey is a good neutral but I like more color and pattern. This is a perfect little stool--very simple, sturdy and super attractive. Great purchase! I bought these for my cats to sleep on in the sun. They like the curve. I am glad I bought them. Super easy to put together perfect height, we liked it so much we bought two. It’s easy to clean also. No complaints, cute little bench. It was somewhat easy to set up, although I needed an additional screwdriver that was not provided. The stool sits really low, but it meets my needs for a footstool to take my shoes off as I get in the house. This ottoman was somewhat difficult to put together. Certainly harder than I had expected for such a small item. I got the ivory colored fabric, which is not as high-quality as I had hoped. The wooden legs are attractive though and I am overall satisfied. Great little stool! The only thing I would say I didn’t particularly like about it is that its legs are a darker brown than what the picture shows — so it doesn’t completely match the rest of the wood in the room. This is not a deal breaker though. I found it very easy to assemble, about 15-20 tops. It’s a nice sturdy little foot stool that fits perfectly in a small space! Perfect for a teenagers room as an extra seat, but usually just the bottom of a pile - she can tell me that her clothes are NOT on the floor. Oh, well. Love this footstool! It is very versatile. Lightweight and easy to move yet perfectly sturdy and comfortable. We have used as as a stool as well when playing games around the coffee table. Would highly reccommend. Easy to assemble. Perfect height and size for my West Elm reading chair. Five minutes to put together. "Is this the same grey as the Baxton Andrea chairs? grey beige? I'm looking to get matching foot stools"
It fit the space and it was what we have been looking to use in our bedroom. "is this sturdy enough for an adult to sit on like a short stool?" This is a footstool and will not withstand an adult’s weight.